Designed by Jesper Voxnæs of Vox Knives, the Boker Plus Vox BOB is an interesting blend of chunky fixed blade and simple Scandinavian design. Mr. Voxnaes has done a number of collaborations with Boker, perhaps most notably his small Gnome neck knife, but this was my first hands-on experience with some of his work. I loved the look of the knife, but admit that Jesper’s design puzzled me a little. It’s a compact shape, but quite heavy for it’s size. I could envision several practical applications for the BOB, but I felt like there was a missing link in my analysis. So I went to Jesper himself for his take on the knife. I’m really glad I did because Jesper proved to be both incredibly insightful, and more than happy to answer my questions. So it’s not only a pleasure for me to review a great knife, but to review a great knife designed by a really cool designer. The Vox BOB has an overall length of 7-3/4″, a 3-3/4″ long blade, and the knife weighs 9.5 ounces. If this sounds hefty for a relatively modest knife, that’s because the Vox BOB is made from a piece 7mm thick steel! Small enough for a pocket. Slim enough for easy slicing and food prep. Thick enough for splitting wood. Have enough belly to dress and skin game. With all that in mind, the heavier blade started to make sense. The knife is still light enough to be easily carried in a bug out situation, if you choke back on the handle with a 3 finger grip it can chop, the full flat grind makes the knife a very capable slicer, it’s stout enough for batoning, and there certainly is enough belly there for field dressing game. I also happen to think that this would make a great camp knife too. So lets continue along the review in my typical format and hit some of the high points of this design. The blade shape is a classic clip point. There is a nice tip and tons of belly. Although I didn’t “bug out” with this knife, I did carry / use it and found the full flat grind and sweeping belly to be especially useful in the kitchen. Despite the thick blade stock the Vox BOB proved to be a capable slicer, and it didn’t hurt that the knife came extremely sharp from the factory. The edge on this knife has been beautifully ground, and I really like the bright satin finish. AUS 8 was chosen for the blade steel. At first I was unsure of the choice, but I am now convinced that the selection makes sense. In a survival situation you need a forgiving steel that won’t chip easily and is not difficult to sharpen. That’s why high carbon steels like 1095 as often used in wilderness survival blades, they fit that description to a T. But if you want to use a stainless steel, it’s best to leave the high end super steels on the shelf as they are typically more difficult to sharpen and are much more brittle. On the other hand, AUS 8 is extremely tough and can be easily sharpened in the field. It’s also completely stainless so there is no need for a blade coating or to worry as much about how you store and use the knife. For this particular blade I think AUS 8 was a good choice. The Vox BOB sports an attractive green canvas micarta handle with red liners and a couple of stainless steel tubular pins. I really like this handle design, it’s a pleasing color combination and a nice choice of materials. Everything is well put together. The scales are flush, nicely finished, and everything lines up. The ergonomics are also nicely done here. The BOB is very comfortable in a regular 4 finger grip. The wide handle fills the hand well, there is a large finger choil, and the broad flat tang has plenty of room for your thumb. There isn’t any jimping, but I find that the overall design offers plenty of grip and jimping is unnecessary. If you want to chop with the knife, Jesper recommends choking back on the handle with a 3 finger grip. Slip a lanyard through one of the tubular pins and you are ready to go. It’s not my first choice for a chopper but again, you have to understand the paradigm within which the knife was designed. The BOB has plenty of weight behind it and should get most chopping tasks done. Rounding out our handle is what Jesper calls the “bonk stud.” Many will recognize this as a “skull crusher” or “non-lethal impact device,” but Jesper prefers to look at this protrusion as a tool rather than a weapon. He suggested that the bonk stud would be especially appropriate for pounding sticks into tinder. Regardless of the semantics (or philosophies) you subscribe to, I think this is a nice addition to the handle. For many overseas made knives the sheath is often the weakest link. Thankfully that’s not the case here. The Vox BOB comes with a hand made and hand fitted black kydex sheath by none other than Tom Krein. For those unfamiliar with Mr. Krein, he is a highly respected US knifemaker, and is also known for his own collaborations with Boker. 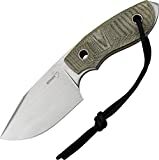 His designs for Boker include the Pocket Bowie and Personal Survival Knife (PSK). Coincidentally, Tom also makes a great kydex sheath. It’s almost goes without saying, but this sheath is beautifully made and has excellent retention. When secured the knife doesn’t wiggle around at all, but it is still easy enough to draw when you need it. The blade and sheath fit together with an extremely satisfying “snap.” It’s just been really well done. In addition to the great sheath you also get a tek-lock, which typically sells for around $10 by itself. Tom designed this sheath for horizontal or vertical carry with the tek-lock, but you could secure the sheath with paracord or some other means. Regardless of the way you decide to carry this knife, the sheath is an absolute home run. I thought the Vox BOB was an extremely cool design on paper, and I’m pleased to say that it’s a exceptionally nice knife in person too. I love the clean lines meshed with the raw versatility of the design. The thick tang is very unique on a production knife, and when combined with all the other details it makes for a very versatile tool. The level of fit and finish is high, and the choice of materials here are all quite good. But what really drives this knife home for me is the inclusion of an awesome sheath. A handmade kydex sheath on a production knife is totally unheard of (but completely welcomed). Retention is crisp, the details are great, and the sheath elevates the BOB from a good production fixed blade into a great one. With a retail price of around $100, the BOB is not particularly cheap. But when you consider that this is a well made knife that comes with both a handmade sheath and a tek-lock I think the price is well justified. The Vox BOB really is a complete package, and I think it’s well worth a look for fans of prepping, camp knives and survival blades. I recommend purchasing the Vox BOB at Amazon.com and BladeHQ. Please consider that purchasing anything through any of the links on this website helps support BladeReviews.com, and keeps the site going. As always, any and all support is greatly appreciated. Thank you very much. Great photos! Is the knife as small as it seems? I have a Vox Rhino and it was much smaller than I originally expected. This knife probably wouldn’t be a great fit for me, but your photos make me want it anyways! I will say it’s much larger than the Rhino. That is a little 2 or 3 finger neck knife. This is a full size knife but next time I’ll remember to do a size comparison or two. Hope that helps! Being so thick, I’d say this would be an excellent design to use laminate stainless. A hard center steel like VG10 and softer support steel like 420 on the outside, just like how Fallkniven does it. Nice looking knife. Looks really beefy. Good review as always. Oooh! RK, once again you have stepped up to the plate and offered an absolutely awesome idea! I love the idea of using a 420/VG10 laminate! That would be killer! And as always, thank you man for the very kind words. Excellent looking knife, I really like the red accent between the tang and the scales. There is something about fat bellied blade profiles that looks very primitive and appealing. If only women thought that about us men… It’s also good to know the knife maker seems like a pretty cool guy! I have found edge retention to be decent, on par with the other AUS8 blades I have used. Boker does a good job with their heat treats so I have no complaints on that front. This is a pretty heavy knife, but I have no problems with horizontal carry. I would recommend handing one yourself if at all possible before buying however, you never really know how well it will work for you until you try it out. Thanks Dan I’ve never been disappointed any Boker products, if you ever get a chance try out something from their traditional line, I have a large yellow bone stockman in carbon steel that gets razor sharp, that I use along with a carbon Opinel at work. It’s the only knife that I can get sharper then the Opinel, people used to tease me and say objects split by themselves at the sight of that blade. Dan be warned if you are a knife Knut like me once you get a taste of traditional slip joint knives in 1095 carbon or CV it’s all down hill, you will keep telling yourself ” this is the last one ” but there is always another, it’s a crazy addiction, that cannot be explained…?